S03E13 – Arrow In The Door Post – was a real snoozer. Character development is fine, though for pacing, mixing it up is always better ie last week’s episode. The problem here was the scene between Rick and the Governor was dragged out far too long. At max their meeting should have been no more than 10 minutes of screen time. As for the rest of the characters their moments signify little because, given the show’s track record, most of it is likely to be swept under the rug any how. Properly structured the first half of the episode should have dealt with the parlay. The second half should have showed each side gearing up and the episode should have ended up with them about to meet in battle. We already know where the story is going to go and now we have to wait for the show to catch up to us. The ‘giving up Micchone’ idea is a total story stalling tactic. Rick has already acknowledged that the Governor is going to kill them all so the supposed struggle about giving her up carries zero dramatic weight or emotional investment at all. So any anguish Rick is feeling at the end of this episode is all sound and fury signifying nada. This episode highlights how the show stumbles when it tries to handle more than two or three characters at a time. Especially compared to the previous week’s episode. S03E06 – Spoils of War – introduces the end game for Spartacus and his followers. The show continues to deftly handle character and story. With a newly coiffed hairdo and shave, for the first time this season, Caesar finally looks like Caesar. No longer sporting a rebel look, the transformation is amazing. Another sign of a strong show – even its transitional episodes are engrossing because they build character while laying the story groundwork for what is to come. Sam Raimi pulled it off. Making a prequel to the original Wizard of Oz – a classic in the truest sense of the word – that honors it and at the same time creates a movie with modern sensibilities, is an awesome feat. Gorgeous to look at and well acted too. James Franco, Milas Kunis, Michelle Williams, and Rachel Weisz all comport themselves well. Especially James Franco as the titular charatcer. 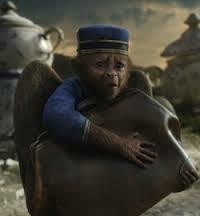 Two of the more endearing characters are Finley – the BellBoy Monkey and the China Girl. Especially the girl. A totally CGI creation but such a wonderful character – whose real world double is a little girl unable to walk. 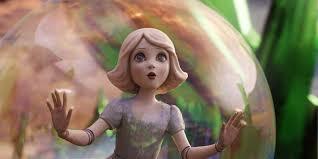 The bond that forms between her and Oz provides the movie with the majority of its emotional thrust. This movie meshes with the original beautifully.